This release may be the most important release yet — for finally after many years, the awesome tiles of Derek Yu are in the game… This moment marks the first public GRAPHICAL release! To make better use of the graphics, the interface has been upgraded, and mouse support has been introduced. The interface has been streamlined in many places, and will be streamlined even more in the near future. To celebrate the graphical release, DRL has also received a significant upgrade in the Audio department, with a MP3 music soundtrack consisting of Sonic Clang’s Classic Doom renditions as well as Simon Volperts DRL tracks in MP3 quality. Sound effects have been substituted with high quality versions created by Per Kristian Risvik. Additionally several balance changes and important fixes have been made. Grab it while it’s hot in the downloads section! Screenshots and YouTube Video is available! However, before you do, please take a moment and Like! our official ChaosForge Facebook Page and/or ChaosForge Google+ Page , and if you didn’t before, follow ChaosForge on Twitter to stay fully informed of the next release! Downloads for Windows, Linux (both 32 and 64 bit) and 64 bit MacOS X are provided (the last one should be still considered a bit unstable — read below). The game executables are universal in the sense that you can run graphical, console, sound or no sound using the same files — for example on Linux the SDL libraries are not needed if running in console/nosound. Download the new version to jump into the fun or join us on IRC ( #chaosforge on QuakeNet ) to celebrate, or read below for the full changelog! Keep your eyes open also for a new version of every ChaosForge roguelike — while there have been no official releases, a lot of work went into AliensRL, DiabloRL and Berserk!. Each of them will have a breakthrough release in the first half of this year — no one shall be left behind! Don’t be surprised if some of them become graphical too! 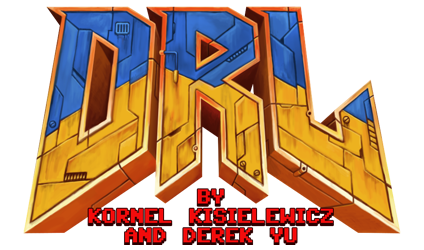 This is a special release, because finally DRL’s world has gotten the shape it was intended to have. While the number of levels got reduced to 24, they are divided into three separate “episodes”, with the grand finale in Dis, against the boss you’ve all asked about! Apart from the new layout, the AI got its revamp finished — most of the beings now have a new (hopefully smarter) AI! Also present in this version are two new Challenges and a lot of tweaks to the Badge system, new powerup and a ton of tweaks and fixes! However, before you do, please take a moment and Like! our brand new Offical Facebook Page , and if you didn’t before, follow ChaosForge and my humble self on Twitter to stay fully informed of the next GRAPHICAL release! Yes, the graphical version you all waited for is almost ready. Even more! ChaosForge Supporters have already been granted access to 0.9.9.5 graphical version beta. So if you can’t wait, donate now, become a Supporter and enjoy the graphical beta! Even if ASCII is your game, take a moment and Support us, for DRL is happening only thanks to you! Downloads for Windows, Linux (both 32 and 64 bit) and 64 bit MacOS X are provided (the last one should be still considered a bit unstable). All versions include sound, no-sound versions (if requested) will appear with the next version. Download the new version to jump into the fun, read the announcement on the Forums, join us on IRC ( #chaosforge on QuakeNet ) to celebrate, or read more for detailed info!